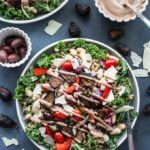 Tuscan Salad with Farro and Fig Tahini Dressing is hearty and flavourful, loaded with fibre and protein, and topped with a thick and creamy fig dressing! Add this salad to your meal prep routine for a filling lunch or dinner option. In a glass bowl, add the hot water and figs. Cover and let soak for 20 minutes. Once soaked, add figs, water and the remaining ingredients to a blender and blend on high until smooth. This makes about 1 cup of dressing. If you prefer a thinner salad dressing, just add more water until you reach your desired consistency. Pour dressing into a jar or glass dish with a lid, and refrigerate until ready to use. Divide all of the ingredients into 4 bowls and top with dressing when ready to serve. You can prepare all of the salad ingredients in advance and assemble when ready to serve. Or assemble the salads in individual containers for grab and go lunches during the week. Just add the dressing when ready to eat. The dressing will last in the fridge for 3-4 days. Just be sure to stir or shake it before adding it to the salad. The prep time for this recipe includes time for the figs to soak and farro to cook.